The later years of a filmmaker's life often see a flurry of retrospectives, lifetime achievement awards, and invitations to reflect on illustrious careers and lives well lived. This is certainly the case for Agnès Varda, now 88. Her work remains in high demand, as do her presence and persona. Her continued relevance should come as no surprise as the realm of work that Varda has spent the past 60-plus years exploring—a multifaceted intersection between narrative and documentary—is becoming ever more in vogue. The time is ripe for strong female role models in the film industry, and after all these years Varda still shines as a beacon of hope amidst the flood of studies and statistics highlighting the struggles of women directors in Hollywood and beyond. Here is a woman who has it all, at least in that classic sense of the term: a dynamic career spanning several decades and continents, great love, devoted children, all the while staying on the cutting edge of contemporary culture. She is an oft-cited role model for a younger generation of filmmakers and artists. Selfies with Miranda July, Lena Dunham, Lav Diaz, and Salma Hayek circulate on social media. But Varda is far from a mere living icon, preserved in some golden amber of past glories; she continues to be very much a part of the contemporary cultural scene. In Miranda July's interview with Varda in August 2015, for Cinelicious’s U.S. release of two of Varda’s little-seen masterpieces: Kung-Fu Master! and Jane B. par Agnès V. (1987), Varda redirects a good portion of the interview to talk about July’s first feature, Me and You and Everyone We Know (2005). She cites the scene in July’s film where a six-year-old boy meets in person an older woman he has been intimately chatting with online as feeling familiar to themes she dealt with in Kung-Fu Master! Varda’s film follows a sort of romance between a 40-year old woman played by Jane Birkin, and a teenager, played by Varda's son Mathieu Demy. In the interview July goes on to tell her that Kung Fu Master! was a direct inspiration for that very scene in her own film. This exchange reveals the way that Varda stays engaged and aware of the younger artists around her, a curiosity rare among such august filmmakers; nothing has become brittle or crystallized about her work or her understanding of what art or film should be. It is not just that she was ahead of her time or that time has finally caught up to her—what is most striking about Agnès Varda's recent activity is the way she seamlessly intertwines the promotion of her earlier films with the production of new work. From Here to There, Varda's five-part documentary series that aired on Arte France in 2011 (and in 2014 in the U.S. on Sundance Now), exemplifies this looking both forward and back. Each segment is a kind of travelogue, taking audiences around the globe as Varda is invited for different exhibitions and screenings. Along the way she interviews other filmmakers and visual artists—some from her generation, some older, and some younger. In the first segment she goes to Chris Marker's studio. Though Marker never appears on camera, their avatars frolic on an island in Second Life that hosts a museum dedicated to Marker's work. Varda's avatar looks just like her, haircut and all, while Marker's takes, of course, the form of Guillaume-en-Égypt, the large orange cat he often employed as his public proxy during his later years. To see these two legends engaging in such a new and modern context does not seem out of place. Varda and Marker were contemporaries, both part of the Left Bank Group in the early 1960s that ran parallel to the French New Wave but tended toward a more experimental documentary approach. They have produced films consistently, if not prolifically since that time, continuing to explore and push boundaries; the freedom with which they both approach their creative works makes even this foray into Second life feel strangely natural. In the same episode she travels to Portugal and pays a visit to filmmaker Manoel de Oliveira, who was 102 years old at the time and still working. She films him doing a Chaplin dance and lets him film her doing the same. The dynamic interaction and spirit of discovery that has run through Varda's work from the very beginning remains without feeling stale or shopworn. She does not just visit older artists, she also goes to Mexico where she pays a visit to Carlos Reygadas and asks him probing and detailed questions about his work. Along the travels and tours documented in From Here to There, Varda sometimes filmed the audiences from the stage where she gave her presentations. She reflects upon her work by doing more work, teaching by example. It is all done lightheartedly, she quips, “Now that I'm old, everyone tends to give me awards and trophies.” She includes clips from her films, her photography, or video documentation of the installations she has made in recent years. Each of these reflections on her work reveals the way that Varda is dynamically shaping her legacy and to a large extent dictating how her work will be remembered. Yet there is nothing nostalgic in her approach. In a 2009 interview, shortly after the release of her autobiographical feature The Beaches of Agnès, she said, “Nostalgia doesn’t make sense, because it’s like bringing the memories back to be a special part of my day or to be part of my week. And I’m inside my memories the same way I’m inside my everyday life.” This is very much the spirit with which she embarks upon her recent endeavors. For the past decade or so Varda has become more focused on visual art; combining still and moving images in galleries and museums. Agnès Varda's first video installation, Patatutopia, was part of the Venice Biennale in 2003. It was a multimedia piece that brought together piles of real potatoes surrounding video screens with close-ups of sprouting, gnarly potatoes, including many heart-shaped ones, recalling those seen in her 2000 film The Gleaners and I. More of her installations can be glimpsed in The Beaches of Agnès, such as when she filled Rue Daguerre, the street she has lived and worked on since 1951 with piles of sand, or set up rows of mirrors on the beaches of her youth. She circles around certain themes and explorations; her installations and films overlap, but none of this feels repetitive—rather each is a contribution to the greater world she has created with her work since she began as a photographer in the 1950s. Between 2013 and 2016, Varda had an exhibit at LACMA reflecting on the films she produced during two extended stays in California in the 1960s and 1980s, was the guest artistic director of AFI fest, and had a dedicated sidebar at Film Society of Lincoln Center's Art of the Real festival. She had a retrospective in Chicago, where she was also filmmaker in residence at the University of Chicago and an exhibition of unseen photographs of her time in Cuba in the 1960s at the Centre Pompidou. Varda continues to produce new work. Last year she was commissioned to make a short film by fashion brand Miu Miu, which premiered at Venice in 2015. 3 Buttons is a fantasy film that follows a young girl in the countryside who receives an elegant dress in the mail and is introduced into a world of magic. The girl walks from the village to Rue Daguerre. Along the way she loses three buttons. One of them is picked up by Michel Jeanne, the fibulanomist, or button collector, who showed off his collection to Varda in a segment of From Here to There. These unspoken homages to her prior work show up again and again, but she also continues to explore new ground, using the lexicon she has created with her earlier work. She is currently filming a new documentary with the young French photo-muralist JR. The official statement about the film says it will “focus on faces, encounters, huge images related to people and mostly the growth of an unlikely friendship between a 33-year-old youngster and an 88-year-old lady.” The two were spotted (and photographed) at Cannes in May and at the French Tennis Open in June. They held a successful and witty crowdfunding campaign so the film could be made free of corporate financing. The film is expected to be finished next year; in May it was already picked up by Cohen Media Group for North American distribution. In the past several years Varda's older films have been given new life as well. Cléo from 5 to 7 was restored and shown at Cannes Classics in 2012, La Pointe Courte's restoration screened at Il Cinema Ritrovato in 2013. Many of her other less known films have also been restored and released, some for the very first time. Today, most of Agnès Varda's films are available in well-produced DVD box sets or through various streaming platforms online. Distribution and a broader audience base may be new for Varda, but she is not resting on her well-earned laurels. There is nothing in her that clings to the past; through her work she reflects candidly on what she has accomplished, on growing older and approaching the last chapter of her life. 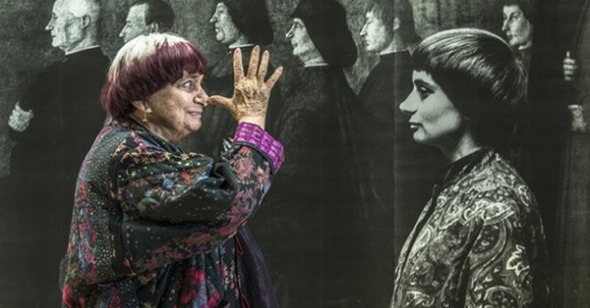 In Varda's official statement about her new film with JR, she states, “As my life draws to a close, I find myself wanting to see ever more faces, to film or photograph them, to keep them in images if not in my memory.” The peace she seems to feel with the present is a balm for a culture that favors youth and the new. It has been immensely satisfying to see how Varda has used the newfound interest in her work to produce more and do more, and in such fresh ways. In interviews about 3 Buttons she marveled at having been granted the budget to spend an afternoon capturing the shot of a button floating down a gutter. The enthusiasm and curiosity that has distinguished Varda's work from the very beginning defines her work today. Bearing witness to the vibrancy of this later phase of her career continues to be a great gift.